Seeing as how that statement applies to pretty much everything, it can certainly be brought up whenever discussing TV shows that’ve been around for what feels like an eternity. For me, it’s hard to remember what life was like without Supernatural because I’ve been watching since the pilot episode first aired back in 2005. So, whether you’ve been traveling on “the road so far” since the very beginning just as I have, or you came on later and did your admirable share of binge-watching, each and every member of the “SPN Family” had to be taken by surprise upon learning that season 15 will be the last. I mean, we knew this would happen at some point, but the blow is in no way softened. Doing his best to moisten the eyes of fans everywhere was series star Jared Padalecki, who shared a nice throwback photo on Instagram. 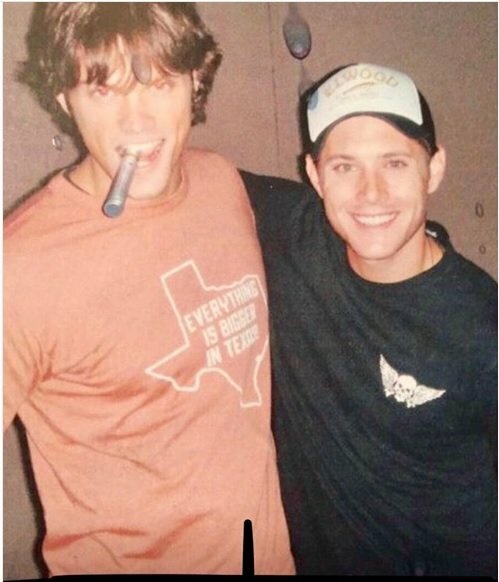 Seen below, Jared enjoys what appears to be a stogie that’d make Arnold Schwarzenegger proud while posing with his (then) new buddy and co-star, Jensen Ackles. Looking at this shows us how far Jared and Jensen have come in the time since. Really, this puts it in perspective just as much as coming across an episode of season 1 being rerun on TNT. And though Ackles looks boyish as well, the younger Padalecki is even stranger to see because the guy just keeps putting on more muscle as time goes on. So, until Supernatural fades to black for the last time, be sure to enjoy every new episode for all they’re worth on Thursday nights on The CW.